About A Complicated Kindness by Miriam Toews: Nomi Nickel lives with her father, Ray, in East Village, a small Mennonite town in Manitoba. She dreams of escaping to the big city, but since her mother and sister left home, it's hard to imagine leaving her father behind. As she begins to piece together the story behind her mother's disappearance, she finds herself on a direct collision course with the town's minister. With fierce originality and brilliance, Miriam Toews takes us straight to the centre of Nomi's world and the complicated kindness at the heart of family life. What a heartbreaker! This is probably one of the saddest, most tragic of books I've read. It's about the Nickels family who live in a very closed touristic Mennonite community in Manitoba, Canada. This is told in retrospect by Nomi who was born and raised there. Without going too deeply into the storyline, this tackles the challenges of living in and ultimately being (or feeling) stuck in a very small, closed community. It is also about the difficult and often painful decisions that need to be made to be able to break away from such a community. Tackling a hot button topic (religion does it all the time), here it is scrutinized and given life, with the impacts quite profoundly playing themselves out on the Nickels family in general and Nomi in particular. The Nickels family is an interesting study with the relationships within their nuclear family sweet, a little oddball, but with the wellbeing of the family always front and centre. The relationships within the community are much more tenuous since the Nickels are related to its leaders. As I pieced together the reasons for the breaking up of the tight-knit Nickels family, so too did I realize that this was not a straightforward story! In the beginning, I thought Nomi was pretty clueless and she seemed, well ... pathetic. But in her cluelessness, my heart went out to her. After all, she didn't know any other life than what she was born into. I also realized that Nomi is quite the spunky one; she's a character that grows on you. She's an innocent so it is difficult see how Nomi struggles to comprehend what is happening to her family and to her life. I found that the storyline can get confusing. But when I digested what I had read, it was a huge "aha" moment for me, and it made things so much more tragic. It is about leaving, it is about staying, and the heartbreak associated with either decision; a predicament that is underscored by Nomi's innocence. 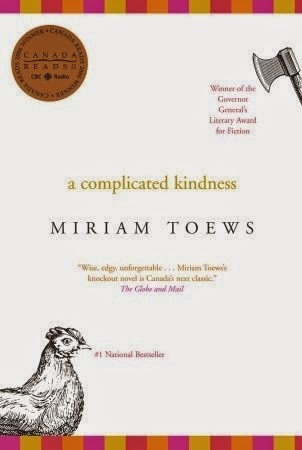 Kudos to Toews for injecting some humour and quirkiness into her characters or this may have become quite depressing. The title aptly captures the complexity of family life bound within a highly conservative religion and community. Verdict: An inside look into the impacts of a closed community on family and individual life. I would highly recommend this to those who enjoy stories told from the viewpoint of young people, and those who like unexpected twists to their reads. If you have kids, this one will likely make you a highly empathetic reader. Read it.